Medically correct compression by lipomed helps the outer skin layer to grow back on to the underlying layers and supports shrinking after a plastic surgery procedure. At the same time, it reduces the formation of oedema and haematomas. The doctor or suitable specialist personnel must first measure the patient, in order to make the right choice regarding size of lipomed. The doctor determines how long it must be worn on the basis of the nature and extent of the operation. Normally this is around four weeks. 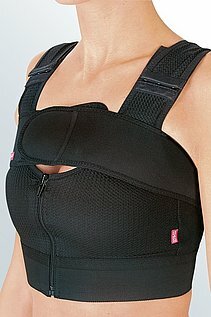 Modern compression corsets like lipomed completely fulfil the medical requirements. medi offers compression pantyhose (lipomed skinline, lipomed blackline), shirts (lipomed shirt) and a bra (lipomed bra) depending on the surgery performed.